I've built many websites for Gosport businesses - all types of business as you'll see in my portfolio. Whatever your needs - if you want a unique website from a web design company that gets you on the first page of Google - give me a call now! 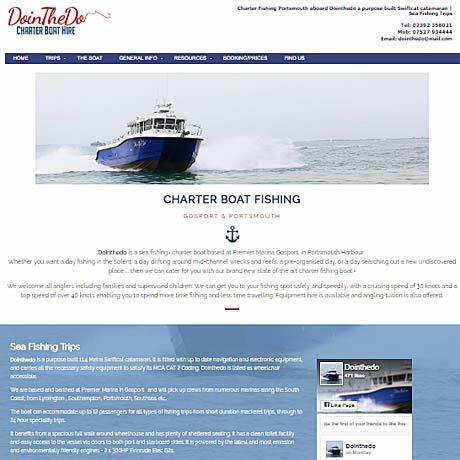 I design inexpensive modern mobile-friendly websites for all kinds of clients in and around Gosport - for sole traders, small and medium sized businesses and much larger business concerns. Clean, simple designs are my speciality - focusing your customers on what's important; enquiries & sales. I'll also write the website content, if you prefer. For an idea of the cost please see my pricing page. I also pride myself in providing a genuine support service for my clients after the initial stages of building a website - so if you need any changes or updates made to your site - just get in touch - I'm just down the road from you or at the end of a phone. I've checked and on average my clients have paid £400-£700. A well–optimised website can pay for itself with a couple of customer enquiries. See More on Prices. That's the idea and I'm pleased to say that 98% of my designs are listed on the first page of a Google search, thanks to good search engine optimisation - SEO. So, is your web design ready for 2017 and is it responsive and secure? All my sites follow the latest standards for mobiles, tablets, and desktop computers. Have a look at my website portfolio and see how I've already helped local businesses not just in in the Gosport area but around the South of England. After spending several months trying to build my own website and not getting anywhere I typed Web Design in Gosport into Google and Gethyn Jones web design was at the top. It has to be one of the best business decisions I've made. Within 7 days my site was up and running and within 4 weeks I was climbing up Google and the enquiries started flooding in. So a very big thank you to Gethyn. I went over my new psychotherapy website on a mobile phone with the manager at the clinic where I work. We both thought it worked very well. Many thanks. It's great. I'm sure I will get more potential patients. I'm top of page one in Google searches. Please note that my service extends to Gosport, Fareham and Locks Heath, Portsmouth, Cosham and Waterlooville, Havant Rowland's Castle, Hayling Island and Emsworth to the East and Southampton, Totton, Hedge End, Chandlers Ford and Eastleigh to the West - and Winchester. Business Support in Gosport from the Solent Growth Hub, Investing in Gosport, Basepoint Gosport, Gosport Business Rates (information), Solent LEP, Solent Enterprise Zone Gosport (Daedalus). I don't believe that the system of 'pay monthly' fees is good value for purchasers who are looking to build their website presence in the long term. Those fees don't take long to pile up and before you know it you start realising that your website is actually costing you a great deal of money. I've written about this at greater length in my blog if you'd like to look at the article: Pay As You Go Websites. Over and above my initial build price, there is an annual service charge of £50 for secure, superfast web hosting (mandatory) and I provide a support service for site security, SEO maintenance and content updates that will keep your site looking fresh and relevant. The cost of this will depend on the size of your site.